Cameras, cowgirls and pure bliss! Sounds like the perfect combination to me! Wendy Tunison Designs, Keystone Scraps and Ponytails Designs have teamed up to bring you this awesome, jam packed grab bag full of so many things you'll never even begin to wrap your mind around them! Now you know you don't want to miss out on this one! It's only available through November 3rd during DSD weekend at the insane price of just $6.00! Inside you'll find 186 Unique Ellies, 70 Unique Papers, and 3 Alphas to delight you! Take a look at the gorgeousness, our CTs have put together with these kits! As always, click on the image to see it much larger! Here's a closer look at my layout. See how versatile Cowgirl Chic is? It even works to show off lil' cowboys too! 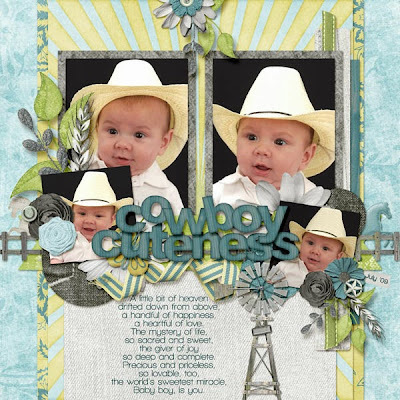 Here's my freebie using Cowgirl Chic. Click here or image to download. Pretty awesome right? Wendy has two more fun specials for DSD too! If you've got a lot of her kits on your wish list and want an even better deal than the 50% off her stores will be this weekend, check out these build your own bundle options!